Ultra moisturizing serum for the face based on the fat horse Horse Oil Yanchuntang Belov for intensive super moisturizing and maintaining a normal water balance of the skin throughout the day. The emulsion is made by high concentration of the components of the formula, which action is directed to replenishing water in the cells of the dermis and hold it inside. Skin that gets regular moisturizing, much less susceptible to the harmful effects of the environment. The cells filled with moisture does not occur, and aging deterioration because not form wrinkles and creases. Due to the moisturizing emulsion Yanchuntang Horse Oil Aqua Ultra Moisturzing Emulsion can easily get rid of the feeling of "tightness" of the skin, smoothed wrinkles, improve skin tone and turgor equalized. 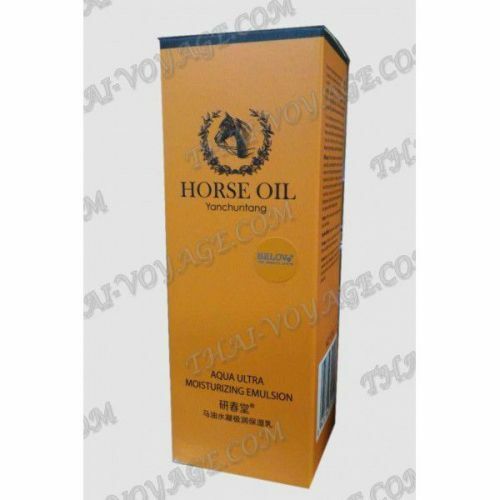 Natural collagen in the emulsion Yanchuntang Horse Oil Aqua Ultra Moisturzing Emulsion restores the integrity of the cells, improves skin elasticity, tightens facial shaft, removes puffiness. As a part of horse fat, the main active component of the emulsion, contains a large amount of essential amino acids and useful. It is known that the amino acids to prevent premature aging of cells, because they are able to neutralize the action of free radicals. Thanks amino acids can easily save the youth and strength of the dermis cells. One of the most unique amino acids Arginine named horse fat. It strengthens the walls of blood vessels, muscle fibers and improves skin tone cells. The result will be visible on the face, when tighten oval face, wrinkles disappear and vascular mesh on the wings of the nose and under the eyes. Useful minerals horse fat heal small wounds, prevent the formation of acne and inflammation, smooth scars on the skin. It is noted that the horse fat easily and maximally absorbed by the body. This remarkable property of the component provides an incredible effect on the application Yanchuntang Horse Oil Aqua Ultra Moisturzing Emulsion. The main active agent components: caprylic acid, arbutin, collagen, horse fat, polyglutamic acid, vitamin C, vitamin E.
To use: Apply product to cleansed face, neck and décolleté, gently rub. Do not rinse. You can use every day. Suitable for all skin types.